After remaining range bound with modest gains for most part of the session on Tuesday, the benchmark NIFTY50 pared its gains rapidly in the last hour of the trade. It ended negative losing 18 points or 0.17%. Going into trade on Wednesday, we enter the penultimate day of expiry of current derivative series. We expect a tepid start to the trade and also expect volatility to remain ingrained in the session. In our previous note, we had elaborated on the behavior of the Markets vis-à-vis the levels of 100-DMA and the support zone of 10300-10276. Wednesday’s market analysis will remain no different. NIFTY has ended a notch below 100-DMA mark which stand at 10398. But it has remained within its filters and its behavior vis-à-vis the support zone of 10276-10300 would be extremely crucial. The levels of 10395 and 10450 will play out as immediate resistance area for the Markets. Supports come in at 10310 and 10275 zones. The Relative Strength Index – RSI on the Daily Chart is 35.4477. It has once again shown a Bullish Divergence against the NIFTY. NIFTY has formed a fresh 14-period low while RSI has not done so. Daily MACD stays bearish trading below its signal line. No significant formation were observed on Candles. While having a look at pattern analysis, NIFTY failed to clear the resistance area of 10480-10500 and while retracing from those levels, also slipped below the 100-DMA mark of 10398. However, it stays within its filter and trades near important short term support zone. 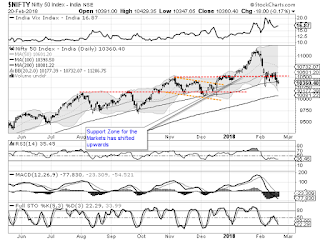 Overall, if we take a extremely short term view, persistent Bullish Divergences on the lead indicators reflect the struggle and the attempts of the NIFTY to find a base around current levels. However, for this to happen, it will have to move past the 100-DMA mark comfortable and advance further towards 50-DMA. 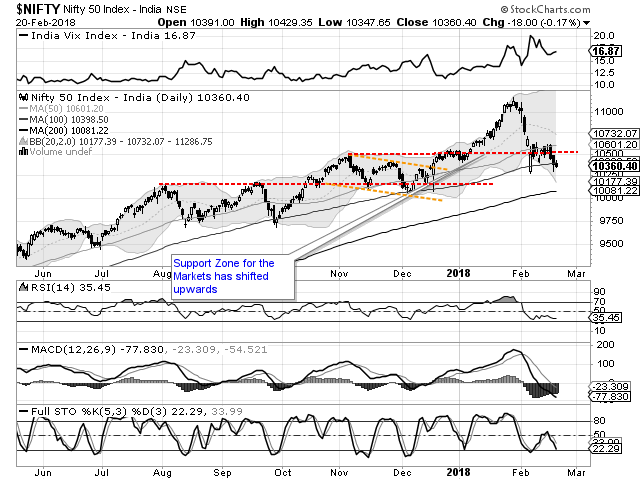 Unless this happens, NIFTY will remain at the mercy of the immediate support zone of 10300-10275. Any breach of this will bring in fresh weakness. There are large numbers of shorts opening up in the system. Looking at this input and coupled with the fact that NIFTY currently trades near to its short term support, we do not recommend opening fresh aggressive shorts in the Markets. We recommend staying away from creating major exposures and continue to make select quality purchases in select sectors wherein relative out-performance will be seen. Long positions were seen being added in STATE BANK, DISHTV, VEDANTA, ASHOK LEYLAND, ONGC, TATA MOTORS, EQUITAS, NMDC, JSW STEEL, HINDALCO and AMBUJA CEMENT.